Posted 10:16 pm by Administrator & filed under News. HPA’s Interiors Group was honored with a Design Excellence Award from the Illinois chapter of the American Society of Interior Designers (ASID). AMLI Lofts was named “First Place – Hospitality” at the Celebration of Design Gala held on September 18, 2015, at The Ivy Room at Tree Studios. Aracely Nevarez, Head of HPA’s Interiors Group and the partner in charge of the project, accepted the award on behalf of the design team. AMLI Residential representatives Steve Ross and Jennifer Wolf were on hand when the win was announced. 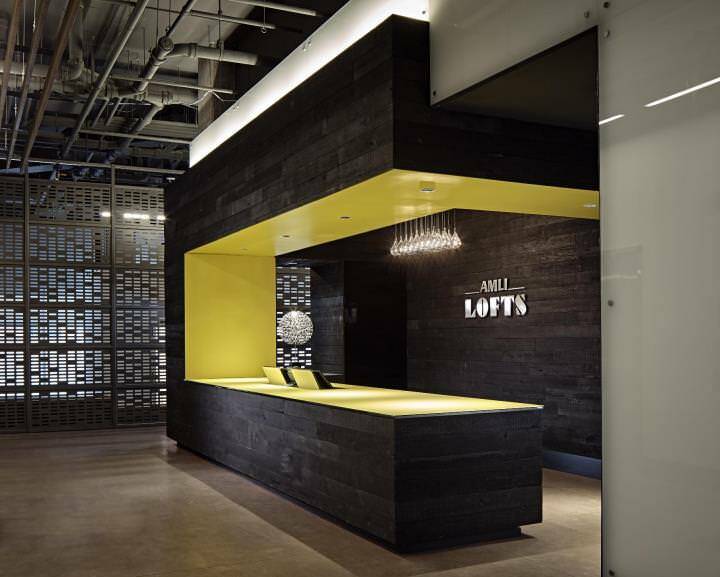 AMLI Lofts is an upscale lifestyle development in Chicago’s vibrant South Loop neighborhood that is redefining loft living with spaces that exude urban chic. HPA’s Interiors Group was retained by AMLI Residential to create amenity and common-area spaces that complimented the loft aesthetic of the 398-unit, multi-tower property. A key challenge for the design team was to give discrete spaces among the two towers unique characteristics, while maintaining a consistent, unified feel. The use of exposed finishes, luxurious textures and patterns, and bespoke furnishings give the varied amenity spaces distinctive qualities while maintaining an overall cohesive industrial aesthetic. The ASID was founded in 1975 and is the oldest, largest, and leading professional organization for interior designers. This year marks the 12th anniversary of the Interior Design Excellence Award Competition, which honors interior environments that have influenced beauty and function in the residential and commercial sector. Reference the AMLI Lofts Project Page for additional project information.